Forum Index > Historical Arms Talk > Where do I find this warhammer? Posted: Tue 01 May, 2018 7:29 am Post subject: Where do I find this warhammer? "scholagladiatoria" uses it in his videos, and I have no idea where I can get my hands on one. I believe he got it from an "Eastern European" supplier, as he mentions in one of his vids. I don't know how to contact him directly, and I've scoured the comment sections of his vids with no success. Please let me know if you have any info on the source of this weapon! I have had one of these sitting in a basement corner for many years. They're not very pretty but perfectly functional. Thanks guys. I'm familiar with both those hammers. The german one is from windlass, it's pretty nice for the cost. The arms and armor one is way too much money for me, and it has a top-spike, which I don't want. The one in the pic I posted is almost exactly like the A&A one, sans top spike. If you have any other leads, let me know! It's not a custom piece from Tod, is it? I recently bought this one, and can recommend it. It's inspired by the Wallace Collection piece we see in so many books. 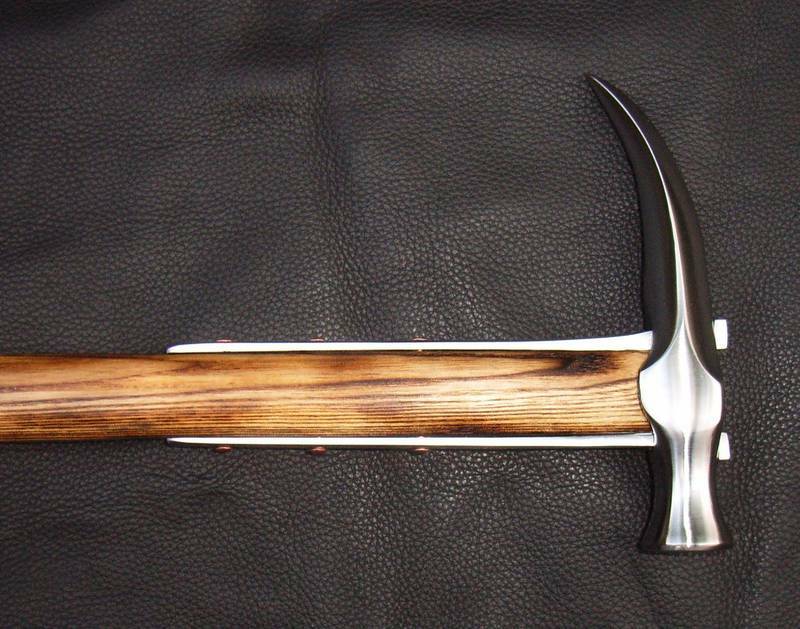 That hammer, as some will know, is oversized for a single-hand weapon, and probably is a re-mounted fussstreithammer. This inexpensive repro is also oversized but very well made. I'll be re-hafting it to more appropriate length. That is the Lord of Battles "Corvus Warhammer." I've had that one before too. It's heavy, and the fitting of the various components could be better, but for the price it's great. I'm really looking for the one I referenced in the original post. That said, I may end up buying the one you mentioned again and removing the top spike for a close approximation. I think I recall watching Matt's review on his "wallhammer," and I am very confident that he does in fact have the A&A warhammer. If you want a better price, you'll probably need to settle for a lower-grade piece. I will state one thing - don't buy a Windlass warhammer unless you want a project - their hammers are secured to the hafting with low-strength wood screws which will not hold up, and the hafting itself will fracture or crack under shock / impact. Thanks for the info. I scoured his youtube channel and I can't find any warhammer review besides him talking about later period all-metal versions. He may indeed have the A&A warhammer, but the one pictured almost certainly is not it. Unless he modified it to remove the top and side spikes. The A&A hammer also has 2 screws/tacks on the short langlets, while the one in the video has only one. I believe Matt Easton addresses his "wallhammer" in one of his Q&A specific videos. My tired brain also thought it was said to be an old Arms&Armor piece. 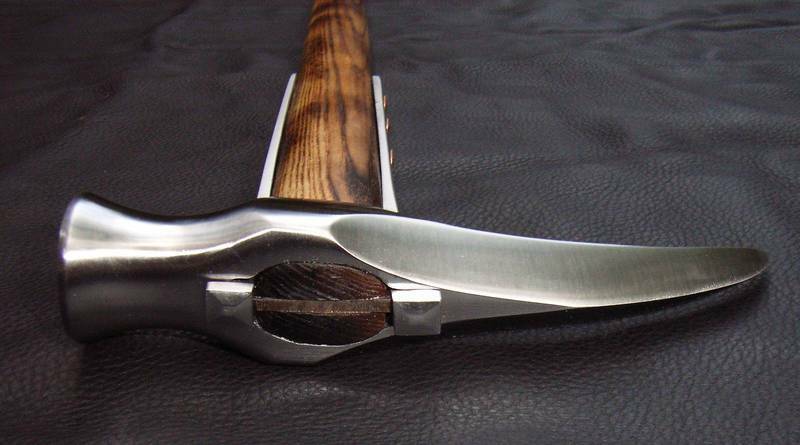 I think it is made by Kasto Armoury, look under their percussive weapon list. Their website is arms-armour, which may be what is causing the confusion. Thanks so much! That's it!!! I guess my tired brain was wrong. Glad you found it. The hammer in the Amazon link above is not actually the Lord of Battle hammer, and does not match the picture advertised. Interesting...but I returned it. I tried to contact Kasto Armory several times with no success -- I fear they may have gone out of business. Back to the drawing board. I may end up having one custom made. From what I know is that unfortunately the smith who made this piece (Achim W. - ´Die Traumschmiede´) isnt blacksmithing anymore. Too bad. But maybe someone will pick up the idea. I have the feeling this thing would sell. Very nice! I love the position of the langlets. According to him, he ´thinks´ he saw something similar on a persian "Zagnul". It sounds to me like this was his own creation by putting the features of several originals together. Very nice outcome. The thorn looks so amazingly badass. PS: Sorry, I confused this Achim W. (Achim Wirtz)from the forum with the retired sword smith Arno Eckhardt. The guy from the forum seems still to be active but I cant find a website of him. So I guess its a hobby smith or at least not an arms smith by profession. Which doesnt necessarily say much about the quality. The person who made this knew what he was doing. Good to know theres someone who can be asked. But sorry for my mistake in the first reply.